Passing a current through a suitably arranged P-II junction can generate light. The reverse is also true: that is. shining light all a suitably arranged P-II junction can produce a current in a circuit that includes the junction. This is the basis for the photo-diode. When you. 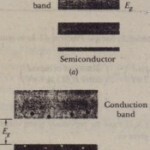 In the arrangement of there are many electrons in the conduction band of the »-type material and many holes in the valence band of the p-type material. Thus. there is a population inversion for the electrons: that is. there are more electrons in higher energy levels than in lower energy levels. As we discussed in Section 1-12, this is normally a necessary-but not a sufficient-condition for laser action. When a single electron moves from the conduction band to the valence band. it can release its energy as a photon. This photon can stimulate a second electron to fall into the valence band. producing a second photon by stimulated emission. In this way, if the current through the junction is great enough. a chain reaction of stimulated emission events can occur and laser light can be generated. To bring this about, opposite faces of the P-II junction crystal must be flat and parallel. so that light can be reflected back and forth within the crystal. (Recall that in the laser of Fig. 41-21, a.pair of mirrors served this purpose.) Thus. 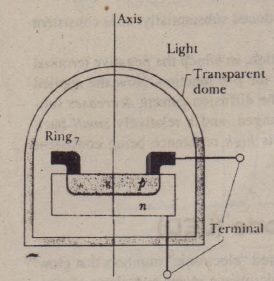 a P-II junctions act as a junction laser, its light output being highly coherent and much more sharply defined in wavelength than light from an LED. Junction lasers are built into compact disc (CD) players. where. by detecting reflections from the rotating disc, they are used to translate microscopic pits in the disc into sound. They are also much used in optical communication systems based on optical fibers. Figure 42-17 suggests their tiny scale. Junction lasers are usually designed to operate in the infrared region of the electromagnetic spectrum because optical fibers have two “windows” in that region (at A = 1.31 and 1.55 pm) for which the energy absorption per unit length of the fiber is a minimum.